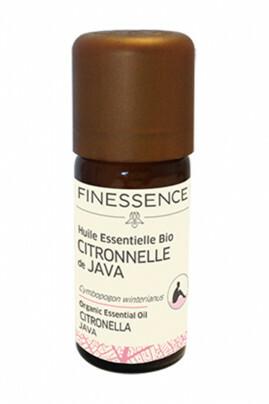 The Finessence Organic Java Lemongrass Essential Oil is known as a natural repellent! Thanks to its lemony and slightly peppery smell, it repels mosquitoes. In healing, it soothes and soothes insect bites. Rich in anti-inflammatory active ingredients, it is recommended to improve joint comfort such as rheumatism. It also has digestive and detoxifying virtues, ideal after a hearty meal. In cosmetics, its regenerative properties make this oil the ally of problem skin and damaged. It brings radiance to the complexion. The Essential Oil of Lemongrass Java Bio Finessence is part of the essential natural care on summer nights ! Cutaneous application : Add 4 drops of essential oil to a teaspoon of vegetable oil. Infusion : 3 to 4 drops on a piece of sugar or in a spoon of honey. Mix in one liter of lukewarm water. Atmospheric diffusion : Comply with the instructions of your diffuser of essential oils for the dosage and the diffusion time. Generally, it is allowed to broadcast 30 minutes for a large room and 15 minutes for a room. Organic Java Lemongrass Essential Oil is 100% natural ! Cymbopogon winterianus (Citronella) herb oil, linalool*, limonene*, citronellol*, geraniol*, citral*, eugenol*. Contains: citronellal, geraniol, citronellol, limonene. May cause an allergic skin reaction. Cause serious eye damage.